Sat., May 7, 2016 * 10:00 am * It was hot.... it was cold ... hurry on up & let's get it SOLD! 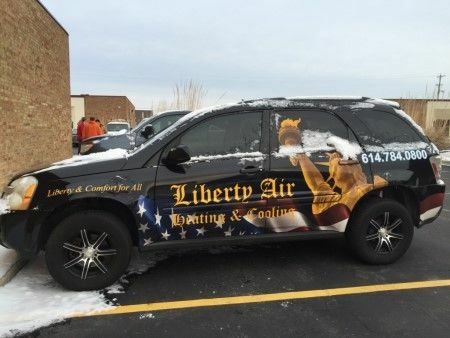 The "Liberty Air Heating & Cooling" Absolute Auction had the thermostat set at SELL! The bidders may have been lukewarm when they arrived but once the bidding began, the temperature rose & the trucks, vans, lifts & jacks BOILED with the prices obtained that morning! Thanks to all who joined us in Columbus for this Court Ordered Receivership Liquidation Auction, Jeffrey M. Lewis, Atty. Absolute Auction! Everything sells to the highest bidder regardless of price! 10 Vehicles - 2 Trucks * 6 Utility Style Vans * 2 SUV’s * 3 Scissor Lifts * Forklift No smalls Quick Auction! 1. 2008 Toyota Tundra Pickup, single cab, V8, hitch, long bed, automatic, showing +/- 73,200 miles, CD-AM/FM, cloth interior. 2. 2010 GMC Savanna Utility style work van with shelving and storage, MFG: 3/10, automatic. 3. 2006 Ford Econoline E-150, Utility style work van with shelving and storage, automatic, showing +/- 104,200 miles. 4. 2010 Chevrolet Express Utility style work van with shelving and storage, showing +/- 145,406 miles, automatic, MFG: 1/10. 5. 1998 Chevrolet Astro Utility style work van, with shelving, storage and lock box console, CD, showing +/- 134,404 miles, automatic. 6. 2007 Chevrolet Express Utility style work van with shelving and storage, MFG: 8/06, automatic. 7. 1998 Ford Econoline E-150 Utility style work van, showing +/- 154,842 miles, side damage, hitch, power windows and locks. 9. 2003 Ford Escape, silver, not running, automatic, 4 door, power locks/windows. 10. 1997 Chevrolet Sierra extended cab pickup, hitch. 1. JLG 1930 ES (green), ID card information: Model 1930ES, Serial: 0200133192, 24 Volt, Model year 2005, 18.8 ft. max platform height, 500 lbs rated work load, machine weight 2,680 lbs. 2. JLG 1930 ES (orange), ID card information: Model 1930ES, Serial: 0200135348, 24 Volt, Model year 2005, 18.8 ft. max platform height, 500 lbs rated work load, machine weight 2,680 lbs. 1. SLC-24 Genie Material Lift “Genie Superlift Contractor”. 2. 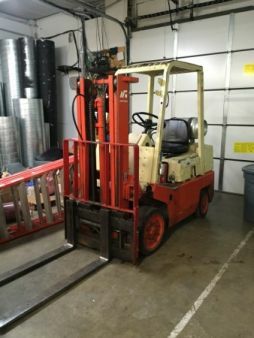 Haul Master 2.5 Ton Pallet Jack, 3 position control level, +/- 5,000 lb. capacity. KNAACK Work Boxes: (2) Model 89 Storage Master Chest KNAACK job boxes, +/- 30” deep by +/- 59” wide by +/- 46” tall. Personal Property Terms: Absolute Auction sells to the highest bidder; Paid in full at time of sale cash or check with photo ID; Sold in As-Is condition with no warranties expressed or implied. All merchandise to be removed day of sale. Checks made payable to: Jeffrey M. Lewis, Court appointed receiver for Liberty Air Heating and Cooling, LLC., Case #: 15CV11779, Franklin County Common Pleas Court. All information provided is to be utilized strictly as a guide. Any announcements made only by the auctioneer from the podium during the time of auction will take precedence over any previously printed material and/or any other oral statements made or implied. No liability exists regarding the information contained in any printed matter for its accuracy, errors or omissions.